There’s something special that happens when The Style Collective sisters get together. And, when the get together is held at one of the most picturesque venues in the South Bay, special is taken to an entirely new level. Recently opened in Redondo Beach on the marina, Shade Hotel has developed a well deserved reputation. The new hotel is the sister hotel to Shade Manhattan Beach, which is a mainstay with it’s lovely cocktail bar and outdoor patio. Each Shade property brings with it a unique vibe. The South Bay sets the stage for a relaxed, family friendly atmosphere. Arriving at the hotel is always a treat. The Valet staff whisks your car away in an instant and always with a smile. A delightful restaurant, Sea Level, offers both waterfront dining or a casual bar with views of the marina. Light, bright and cozy, Sea Level bar is a great place for a casual evening. Inside and out, it’s clear that Shade was built to provide the best of everything. The Staff is highly attentive to all of your needs. You have to love a hotel that places a priority on the importance of sleep. With a Tempur-Pedic bed in every room, you may never leave your room. As it says on the Shade Hotel site, the staff truly delights in treating it’s guests and making sure that your stay is a pleasure. Each guest room features Artisan bottled water and a variety of gourmet coffees. Shade’s philosophy permeates the hotel with it’s desire to restore and rejuvenate you. It’s taking your travel experience and making it more personal, attending to every detail to ensure that you return time and time again. It’s a whole new concept of what staying at a hotel can mean. Staying at Shade, there’s something for everyone. With the beach located nearby, you can relax and get into the Boho beach vibe. Relaxing at the rooftop pool with a delicious libation or getting cozy in the balcony’s private spa tub with a champagne flute, Shade is your place. With it’s gorgeous rooftop deck overlooking the marina, it’s always cooler in the Shade! The property is a posh boutique style hotel with 54 spacious rooms, each one more beautifully appointed than the next. The aesthetic is soft greens, tranquil blue hues, accented by exotic woods. The setting imparts you with a feeling of serenity. Signature services are always part of the standard package when you visit Shade. With multiple restaurants surrounding the property, there’s so much to offer if you decide to leave the cozy confines of your room. There’s always something happening at this location. From lively events to the most beautiful weddings, this coastal property is a delight to the senses. It’s the perfect escape for those living in Los Angeles as the South Bay has a vibe of it’s own. You’ll feel like you were whisked away to the islands, returning rested and rejuvenated, as that’s the mission of Shade. In true fashion blogger style, the SC sisters were decked out in various shades of red, pink, white and on a mission to celebrate Valentine’s Day with a splash. Shade made us feel welcome and pampered with a delightful champagne toast upon arrival. Sea Level Restaurant is filled with comfy sofas and fire pits and it wasn’t long before the sofas were overflowing with colorful fashion bloggers excitedly chattering away. Serving up the crispiest, mouth watering pizza loaded with carmelized onions and the tastiest goat cheese. The women were definitely enjoying the treats along with the atmosphere. Our waiters brought out a fresh beet salad with arugula pesto and toasted pistachios to top it off. The piece de resistance was a tasty citrus cured hamachi with one of the most beautiful presentations in town. We laughed and toasted as we began forming new connections, sharing our fashion blogging and life journeys together. Annie Spano is the visionary behind the Style Collective which is a lovely group of over 1000 female bloggers coming together to form a collaborative, supportive community. Annie’s delightful energy of inclusion and kindness permeates the collective and the hearts of the women, forming intimate bonds and a deep desire to help one another. It wouldn’t be a fashion blogging event without raffle prizes and goodie bags filled with treasures. My darling side kick and partner in organizing the event, Jessica Maurine and the creator of Petite Style Script, made sure we were taken care of with lots of sponsored treasures. Jessica is a big fan of Dermalogica and won us all over with gifts of their daily superfoliant. Having been a fan of Dermalogica for decades, this was a welcome surprise. Core Water provided the natural refreshments with their classic water as well as several fruit flavored varieties. Core has developed a reputation with it’s ph balanced reverse osmosis water which kept us happy and hydrated. We were treated to two fabulous macaroon creations that were not only gorgeous but tasty as well. Beautifully done, a Lette Macarons tree is quite the experience. With each tasty creation hand made with tender, loving care, each almond cookie delights your taste buds with it’s own unique flavor and personality. Lette Macarons treated us to two of the most beautiful macaroon trees in true Valentine’s splendor. Rounding out the gift bags was a gift from Bloomingdales and Kiehl’s counter. Fond of natural products, Kiehl’s has been a leader in the field with products to help you look and feel your most beautiful in the most natural way possible. Balloon Celebrations delivered an enormous truckload of balloons and went out of their way to ensure the event was a success by setting a lively and fun vibe. Debbie Savage, one of the SC sisters and the creator of www.tothineownstylebetrue.com brought along some awesome raffle prizes donated by Guilty Soles. Guilty Soles is known for fabulous trendy shoes at ridiculously affordable prices. From over the knee boots, to sassy kicks to strappy sandals, Guilty Soles will have you stepping out in style withhout printing with your wallet. The company kindly donated several pair of shoes for the raffle and gifted every blogger a $30 gift card to use on their site. There’s no easier way to win over a fashion blogger’s heart than with a new pair of shoes! It was a wonderful afternoon of cocktails, conversations and connection. 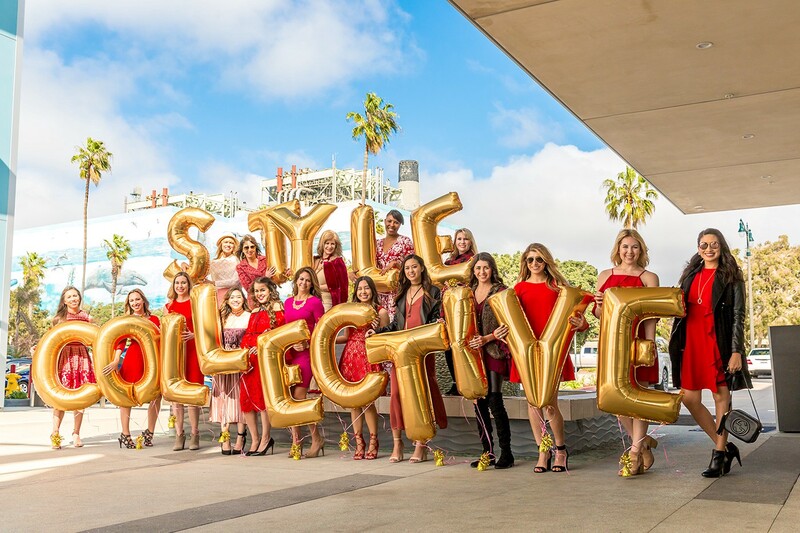 I’m pretty sure I’m speaking for the South Cal Style Collective sisters that joining Annie Spano and The Style Collective is one of the best decisions I’ve ever made. As #GirlBosses, we’ve developed a bond like no other united in bringing beauty to the world and to one another. Fashion is a powerful medium and we are delighted to be on this journey together. Women of all ages are welcome. The day finally came to an end with hugs and promises to meet up again soon. Thank you to Meggie Clausen, Jenna Ritter and Melissa Marcus for your warm Shade welcome and an afternoon of pure delight! The staff at Shade have perfected the customer service experience, always leaving you with a smile. Thank you to our stylish SC sisters from Southern California for driving as far as San Diego or flying from San Francisco to attend…now that’s dedication! Please check out these fabulous fashionistas for more style inspiration and consider joining The Style Collective to be included in the fun! We have lots more wonderful upcoming events on the way.